Lupus. 2015 Apr;24(4-5):483-9. doi: 10.1177/0961203314558676. Gendelman O(1), Itzhaki D(2), Makarov S(3), Bennun M(3), Amital H(4). They felt the improvements seen were due to decreased cytokine levels. I am not sure if the only ones who responded were deficient but all cases where I live have at least a mild deficiency unless taking supplements. Study comes from Israel and vitamin D deficiency is rampant in middle east (they cover up) so… I have written and asked them if thought response related to deficiency. Comment – a drop of 1.2/10 versus placebo is clinically significant as Cymbalta (duloxetine). 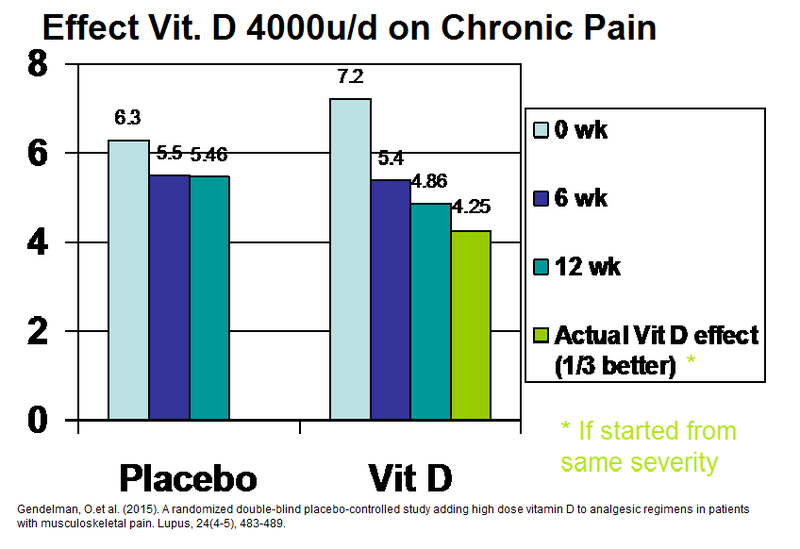 Combine with high dose B12 maybe some people could in some cases achieve 1/3 improvement in their pain. Offers exciting possibilities as chronic pain sufferers (esp old) do not tolerate traditional meds well. I also check androgen levels (lack of sleep and opioids makes it makes it go down) and replace that as well – that definitely helps. There is more available now. For the old and infirm, new options are accumulating where none were. J Clin Rheumatol. 2015 Apr;21(3):126-30. doi: 10.1097/RHU.0000000000000233. 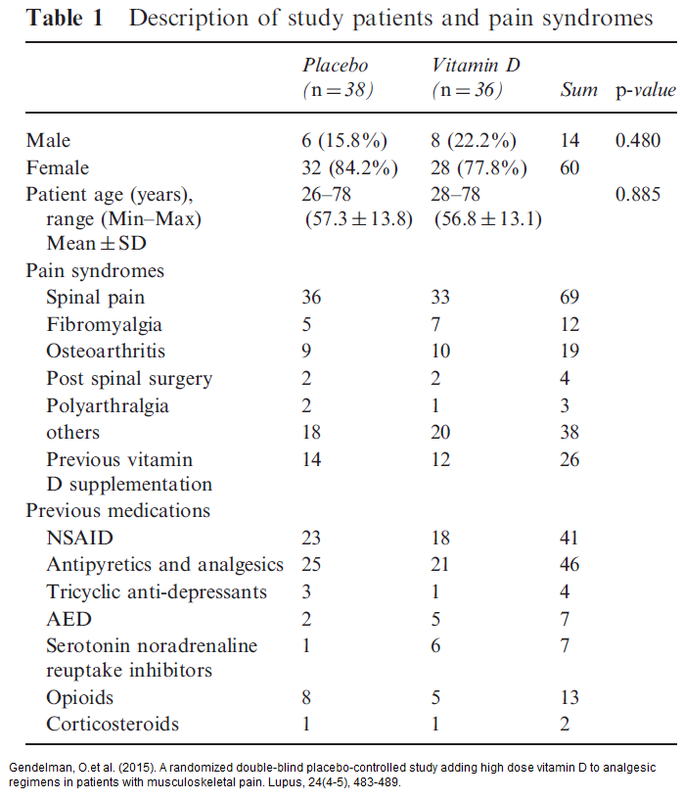 Vitamin d status and its association with quality of life, physical activity, and disease activity in rheumatoid arthritis patients. Raczkiewicz A(1), Kisiel B, Kulig M, Tłustochowicz W.
This entry was posted in Back Pain, Deficits, Drugs, Fibromyalgia, myofascial pain, pain mechanisms. Bookmark the permalink. 4 Responses to Vitamin D – Could High Doses Help Pains?